Willi Wiedenmann from Evoguard GmbH, highlights the cost reduction beneftis of Krones technology. Reducing cleaning-agent losses (one cubic metre represents an expenditure of approx. 30 euros, plus disposal costs) which in turn depend on compressed-air consumption. A dairy with an annual milk intake of around 730,000 cubic metres, for example, will possess more than 500 disk valves, 1,000 seat valves, and about 1,500 double-seat valves. 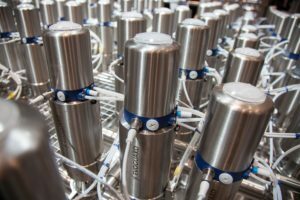 The high total number indicates that an absolute reduction in the amount of compressed air needed for actuating the valves will enable substantial cost savings to be achieved overall. For both disk and double-seat valves, the air volume required in the actuator for switching must be kept as small as possible, without at the same time putting the functional dependability at risk. For disk valves, up to a size of DN 50, it is possible, thanks to optimised design of the valve seal, to use a very small actuator. Here, a reduction to one-third of the air volume could be achieved in comparison to the standard design. Preserving unchanged the operational dependability of the valve, of course. The double-seat valve possesses an actuator with integrated cycling functions. Thanks to a design featuring a double-balanced valve plate, actuators with a very small compressed-air volume can be used here for controlling the valve’s positions. The volume to be filled for the up and down lift strokes is more or less equally small. This leads to short (and incidentally well-nigh identical) response times. Other manufacturers have to fill (and vent) very large volumes here for cycling, like installation spaces for compression springs, or also additional lift actuators, with concomitant effects on response and cycle times. It is true that costs can be saved by these measures, but only to a moderate extent, depending on the costs per cubic metre of compressed air. Cost savings are substantially more marked due to the additionally reduced loss of cleaning agents. 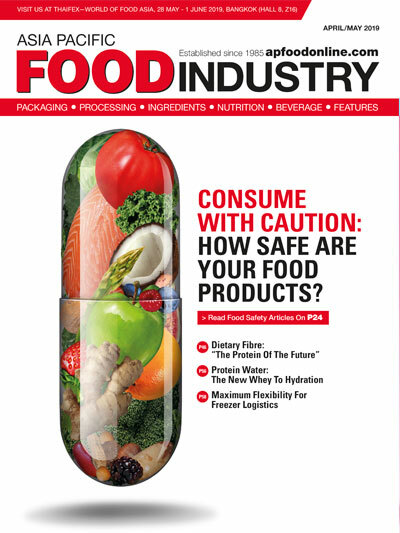 Highly automated sequences for routing products or cleaning liquids necessitate the use of double-seat valves, in order to separate hostile media from each other, with the risk of intermingling totally eliminated. Here, there are two valve plates with seals that work independently of each other, between which the safety and leakage compartment is located, which discharges into the atmosphere and is cleaned by lifting the valve plates. For a valve with a nominal diameter of DN 65 and a cleaning pressure of 2.5 bar, approximately 1.7 litres of cleaning agent per second are passed through this safety compartment and drained off, i.e. are regarded as unrecoverable. In the case of a double-seat valve, the response time already mentioned (filling and venting of the valve’s actuator) for the cycling operations is of crucial importance. Very large spaces in comparable double-seat valves, in which the compression springs are located, or also additional lift actuators, have to be filled with compressed air and vented again. This often takes several seconds. During this time, access to the leakage compartment and thus to the atmosphere is enabled, and the cleaning liquid is, in dependence on the cleaning pressure, discharged into the trough, and has to be disposed of. 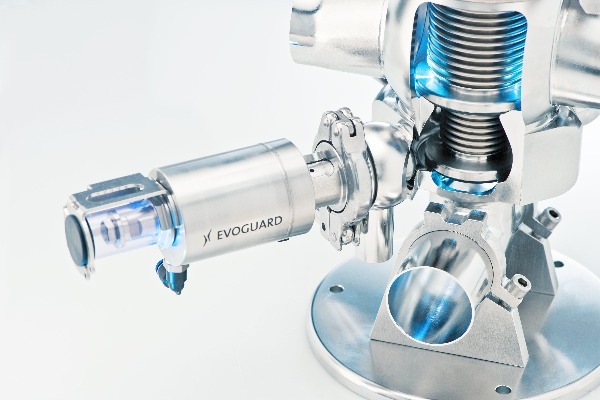 Evoguard has conceived the design and functionality of the valve actuators so as to ensure that the volume to be filled during both cycling strokes is well-nigh equally small, with opening and closing being performed in the tenth-of-a-second range. This produces enormous savings by in comparison. In addition to the higher compressed-air consumption already described, the cleaning-agent consumption of these valves can, by reason of the longer response and switching times, measure up to 90 percent. These “lost cleaning agents”, meaning the savings achievable when the right valve is used, can total up to some 85,000 euros a year. Another very important role in this context, which must not be neglected, is the disposal costs incurred for the cleaning agents drained off. Another option for reducing compressed-air consumption, and thus the amount of “lost cleaning agent”, is to be found in the valve rack, if instead of hoses and cables to the control cabinet the variant with a valve control head is chosen. Here, the control head with built-in solenoid valves is located directly on the valve. The compressed air is supplied via a “thick” central supply line, or is integrated in the frame. The consequence is that only very short compressed-air hoses, which have to be filled with compressed air and vented, are needed from the solenoid valve to the double-seat valve. This enables compressed-air consumption, time and thus cleaning agents to be reduced still further during the cycling operations.